Jeong Mun Heo began his academic journey as a computer science and mathematics student in his native South Korea, but he felt something was missing. 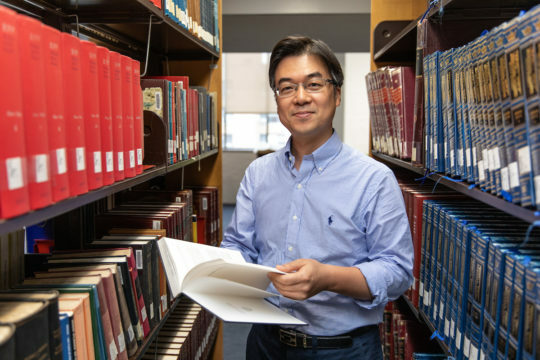 He found himself drawn to the study of religion, earning master’s degrees at Korea Theological Seminary, Boston College, the Hebrew University of Jerusalem and Yeshiva University’s Bernard Revel Graduate School of Jewish Studies, where he is currently pursuing a doctoral degree. “I am convinced that my doctoral study will empower me to accomplish the ultimate purposes of my life in the spirit of the Word of God,” said Jeong. 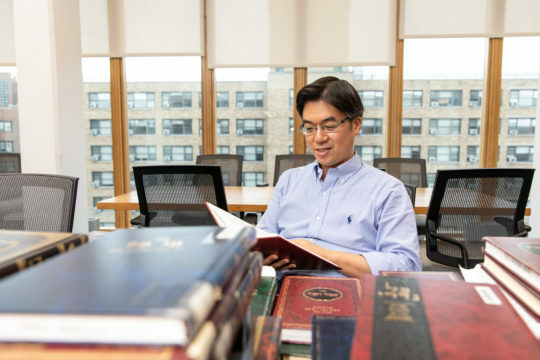 YU News sat down with Jeong to discuss his journey from South Korean computer science student to doctoral candidate in Jewish philosophy at Revel. What inspired you to go into Jewish studies? This question is deeply related to my academic journey before I came to Yeshiva University, where I learned not only the theological doctrines of Christianity but also the importance of their philosophical frameworks. This guided me, among other things, to study Jewish education at Hebrew University of Jerusalem in Israel. Through these studies, I was able to see myself and the world in a new and broader perspective in terms of theological, philosophical, and educational dimensions. What drew you to Yeshiva University? I would say that the most important idea that led me to study at YU is Torah lishmah [study of Torah for Torah’s sake]. What a fascinating concept this is. I believe that it is the best idea I have ever encountered in my academic and religious journey. In fact, what made me want to go to YU is the book Torah Lishmah: Torah for Torah’s Sake in the Works of Rabbi Chaim of Volozhin, written by former YU President Rabbi Dr. Norman Lamm. I read it several times before I came to YU. Even if it seems exaggerated, I can say that Torah is in my heart with burning love and that this is why I came to study here. Any standout courses or lessons learned while at Revel? The most impressive lesson since I came to Revel was in an individual tutorial with Dr. Jonathan Dauber, associate professor of Jewish mysticism. We read and analyzed the original Hebrew texts of the Nefesh HaChaim, written by Rabbi Chaim of Volozhin, who discusses the idea of Torah lishmah. It made me realize not only the deep theological and philosophical meanings of Torah, but it also offered me a great spiritual and intellectual enjoyment. It gave me the conviction that I would become a better student studying Torah in the spirit of lishmah. My primary work right now concerns how philosophical concepts like wisdom and logos in relation to Torah were developed in the Biblical texts with Jewish and Christian sources. I want to understand the profoundly shared philosophical backgrounds of Judaism and Christianity before they parted ways. Both religions have crucial understandings of messianic redemption in the future, and both need to maintain a thoughtful dialogue in recognition of their philosophical commonalities based on the Hebrew Bible. This is will be the starting point for my doctoral thesis. What are your plans when you return to South Korea? I plan to return to Korea after finishing my doctoral study to teach college students in courses related to Jewish studies at a seminary or university. I want to introduce Jewish learning methodologies, such as chavruta [studying with a partner] and talking to each other freely and actively about interesting subjects, to my country and contextualize them in the Korean educational system, which sometimes focuses too much on rote memory. I strongly believe this kind of study eventually cannot only achieve a meaningful academic excellence but also cultivate in a person a sound personality and identity which can support his community and society. I also have a dream of establishing an academic center for Jewish-Christian dialogue in South Korea, which would connect institutions like Yeshiva University and organizations focused on Jewish-Christian relations in the world. I believe now is the right time to start a project like this, and that it will have an amazing outcome.